The East Twin River Watershed is bordered on the east by Lake Michigan in Kewaunee and Manitowoc counties and is 117,493 acres in size. The watershed contains 314 miles of streams and river, 12,446 acres of lakes and 14,181 acres of wetlands. The watershed is dominated by agriculture (75%) and wetlands (12%) and is ranked high for nonpoint source issues affecting streams, lakes and groundwater. Streams in the East Twin Watershed flow southeastward through southern Kewaunee County and northern Manitowoc County to the City of Two Rivers were it enters Lake Michigan. The 101,196 acre watershed is split nearly evenly between Kewaunee and Manitowoc Counties with 42,932 acres (42.5%) in Kewaunee County and 58,264 acres (57.5%) in Manitowoc County (WCD 1966 and 1968). Soils in the watershed range from poorly drained organic soils in the north, to gently sloping clays in the central basin to well drained sandy loams near Lake Michigan. Most of the clay-loam soils are fine textured and easily erodable, which can lead to water quality impacts. The predominate landuse in the watershed is agriculture, although a substantial amount of land is forested. Other activities account for only sixteen percent of the landuse in the watershed. The East Twin River Watershed lies within the Central Lake Michigan Coastal Ecological Landscape which stretches from southern Door County west across Green Bay to the Wolf River drainage, then southward in a narrowing strip along the Lake Michigan shore to central Milwaukee County. Owing to the influence of Lake Michigan in the eastern part of this landscape, summers there are cooler, winters warmer, and precipitation levels greater than at locations farther inland. Dolomites and shales underlie the glacial deposits that blanket virtually all of the Central Lake Michigan Coastal Ecological Landscape. The dolomite Niagara Escarpment is the major bedrock feature, running across the entire landscape from northeast to southwest. Series of dolomite cliffs provide critical habitat for rare terrestrial snails, bats, and specialized plants. The primary glacial landforms are ground moraine, outwash, and lakeplain. The topography is generally rolling where the surface is underlain by ground moraine, variable over areas of outwash, and nearly level where lacustrine deposits are present. Important soils include clays, loams, sands, and gravels. Certain landforms, such as sand spits, clay bluffs, beach and dune complexes, and ridge and swale systems, are associated only with the shorelines of Lake Michigan and Green Bay. Historically, most of this landscape was vegetated with mesic hardwood forest composed primarily of sugar maple, basswood, and beech. Hemlock and white pine were locally important, but hemlock was generally restricted to cool moist sites near Lake Michigan. Areas of poorly drained glacial lakeplain supported wet forests of tamarack, white cedar, black ash, red maple, and elm, while the Wolf and Embarrass Rivers flowed through extensive floodplain forests of silver maple, green ash, and swamp white oak. Emergent marshes and wet meadows were common in and adjacent to lower Green Bay, while Lake Michigan shoreline areas featured beaches, dunes, interdunal wetlands, marshes, and highly diverse ridge and swale vegetation. Small patches of prairie and oak savanna were present in the southwestern portion of this landscape. Streams within the watershed range from those that are intermittent to perennial named streams. Classifications of these streams are also widely variable with multiple classifications found on some streams. Of the 98.9 steam miles in the basin, 67.9 miles have had their biological use classified. In this watershed 12.5 miles of stream are classified as trout waters, 26.9 miles are classed as warmwater sport fisheries, 13.6 miles as warmwater forage fisheries, 9.9 miles as limited forage fisheries and 5 miles of limited aquatic life (WDNR 1995). Unclassified streams have the default classification of warmwater sportfisheries. Historical information about streams in this watershed can provide a basis for comparison to our current work. Earlier surveys indicate that the East Twin River and its tributaries support a variety of fish species. This list should be viewed cautiously, because of the limited data on fish distribution of non-game species from early surveys that did not collect this type of information. Streams in the East Twin Watershed flow southeastward through southern Kewaunee County and northern Manitowoc County to the City of Two Rivers were it enters Lake Michigan. The 101,196 acre watershed is split nearly evenly between Kewaunee and Manitowoc Counties with 42,932 acres (42.5%) in Kewaunee County and 58,264 acres (57.5%) in Manitowoc County. Streams within the watershed range from those that are intermittent to perennial named streams. Classifications of these streams are also widely variable with multiple classifications found on some streams. Of the 98.9 stream miles in the basin, 67.9 miles have had their biological use classified. In this watershed 12.5 miles of stream are classified as trout waters, 26.9 miles are classed as warmwater sport fisheries, 13.6 miles as warmwater forage fisheries, 9.9 miles as limited forage fisheries and 5 miles of limited aquatic life. Fish surveys have been conducted infrequently on the East Twin River, but those studies have found a wide variety of gamefish which range from trout in upper reaches, to smallmouth bass and northern pike in middle reaches to Lake Michigan species in the areas nearest to the lake. Results from the survey indicate that although HBI and IBI ratings have changed little since earlier surveys, it appears that native warmwater gamefish species are nearly absent or low in abundance in many surveyed sections. 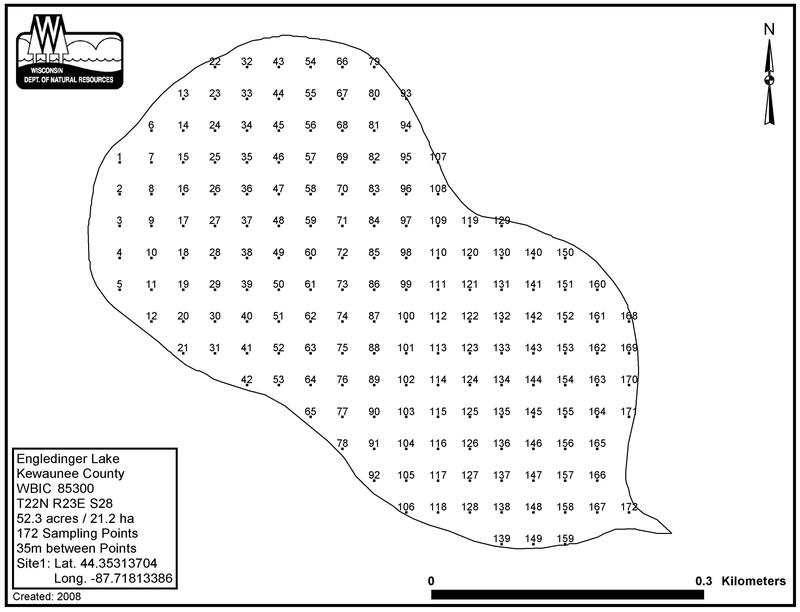 The absence of gamefish from upper sections of the watershed may be due to low flow conditions or habitat loss, in middle sections due to deep pool loss and in lower sections due to low dissolved oxygen. Brook trout populations in Tisch Mills Creek have dramatically increased since earlier surveys while those in the East Twin River remain stable and those in Krok Creek have declined. Increases are mostly likely due to improved water quality, while declines most likely are due to changes in flow patterns. Water quality within the watershed is generally good as indicated by dissolved oxygen levels greater than 5 PPM and cool temperatures. However, water quality in the East Twin River below the dam in Mishicot appears to be impaired with high stream temperatures and dissolved oxygen levels below 5 PPM. Streams within this system are well buffered and feature a variety of large-scale and small-scale habitats for aquatic organisms. Large gamefish habitat however is limited. It is recommended that resource managers use the results from the survey to design protection or enhancement strategies for each stream and then enact these strategies with the assistance of local partners. These strategies should use streambank protection programs (CRP, CREP) to maximize stream bank protection. Within the East Twin River watershed, there are three lakes that have 108 surface acres of water and twenty-two streams with a total of 98.9 miles of water. 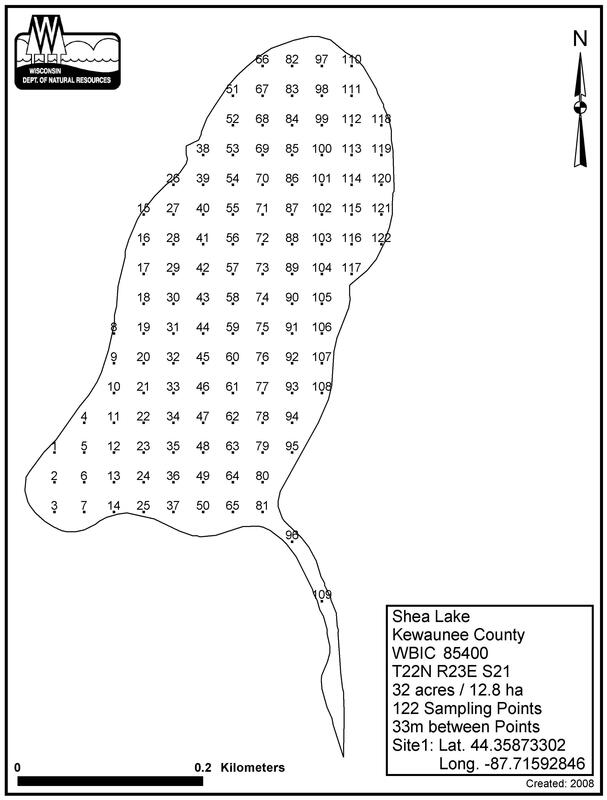 The three lakes, Engledinger, Heidmann and Shea are impacted by surrounding use. Elevated phosphorus levels in the lakes have resulted in the classification of mesotrophic for Heidmann Lake, with the other two lakes classified as eutrophic (WDNR 1995). Historical records indicate each lake has had winterkill problems, but none recently. The exact status of the fish community in each lake is unknown, but records indicate they are lakes with a largemouth bass-northern pike-bluegill mixture. Woodland Dunes Nature Center: Phragmites Control: Woodland Dunes Nature Center and Preserve proposes to implement the Woodland Dunes/West Twin River and East Twin River Shoreline Management Plan for Phragmites 2014-2018. The project elements and deliverables are specified in the Woodland Dunes Aquatic Invasive Species grant application dated January 23, 2014. The project includes: conducting pre and post treatment surveys, treating source populations of phragmites along the river shorelines up to the first dam in addition to the preserve itself; cutting dead canes; handpulling: planting native species; conducting watercraft inspections: participating in Project RED and other educational activities; and providing annual summary reports and a final report of all grant related activities. 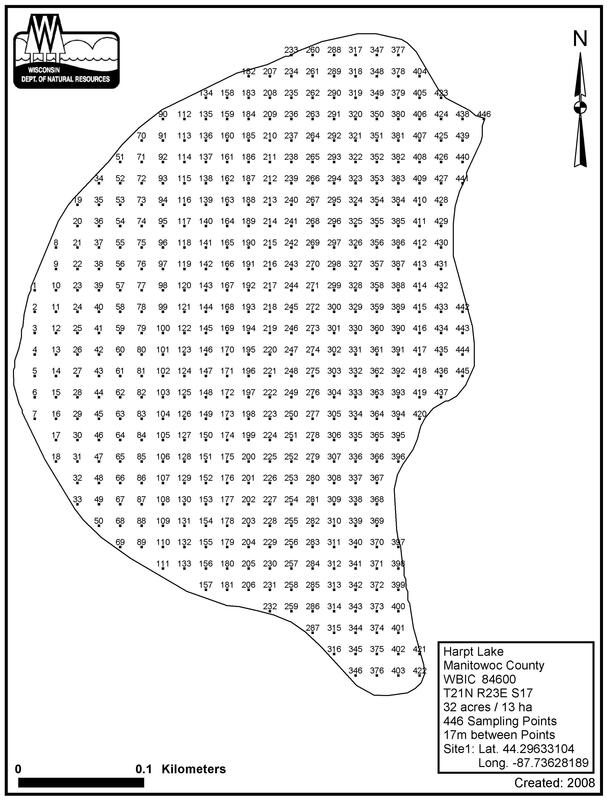 Manitowoc County Lakes Assn: Harpt'S Lake Mgmt Planning Project Ph 1: Manitowoc County Lakes Association, Inc. in cooperation with the Larrabee Sportsman s Club, Inc. proposes to complete a comprehensive management plan for Harpt Lake in two phases. Phase 1 will focus on extensive stakeholder participation, watershed delineation and phosphorus load modeling, lake water quality analysis, environmental sensitive area delineations, and final report preparation. The data collected, along with the public participation effort, will be used to complete a comprehensive lake management plan for Harpt Lake that includes an implementation strategy. The project elements and deliverables are specified in the grant application materials submitted to the Department dated February 1, 2009. Kewaunee County: Hall Manure Storage System: To cost-share installation of manure management and diversion practices to bring the Hall farm into compliance with NR 151 performance standards. Kewaunee County: Reckelberg & Kudick Manure Storage: To cost-share installation of manure storage practices in order to eliminate winter spreading of manure in compliance with the Agricultural Performance Standards and Prohibitions of NR 151.08. Woodland Dunes Nature Center: Twin Rivers Stewardship Group Organization & Development: The Woodland Dunes Nature Center, Inc. proposes to organize, educate, and sustain a citizen volunteer stewardship group for the East and West Twin River watersheds that will set up a program based on Wisconsin\00BFs Water Action Volunteers (WAV) stream monitoring program. The project elements and deliverables will be completed as described in the project proposal submitted to the Department and dated May 1, 2006. Amendment #1: Woodland Dunes Nature Center will assist the City of Two Rivers Stormwater Task Force in development of a comprehensive stormwater public education and outreach program. Woodland Dunes staff will meet with the task force to pritorize education topics and develop or modify existing materials to fit the needs of the Two Rivers community. Woodland Dunes Nature Center: Explore & Restore E. & W. Twin Rivers: Woodland Dunes Nature Center shall supplement and build on previous work by partners to raise public awareness and participation in water stewardship in the East and West Twin Rivers. Specifically, Woodland Dunes will offer educational programs and action projects including WAV trainings, storm drain marking, river and beach clean-up events, guide West Twin River pontoon tours, and river paddles. Woodland Dunes will also coordinate with the City of Two Rivers to provide storm water management education to increase awareness of storm water pollution impacts to the East and West Twin Rivers. Fliers, newsletters, website, and newspaper articles will advertise the events. The project elements and deliverables will be completed as described in the project proposal submitted to the Department and dated April 30, 2012. Woodland Dunes Nature Center: Planning For Two Rivers Habitat: Woodland Dunes Nature Center and Preserve proposes to improve habitat in the watershed of the East and West Twin Rivers by documenting opportunities for habitat improvements and developing an effective program for reaching, educating, and working with landowners to do so. Specifically, Woodland Dunes will develop a plan for increasing the capacity to improve the riparian areas within the lower reaches of the East and West Twin Rivers. Woodland Dunes will develop a plan for increasing outreach to landowners in the area, offering information on habitat management or restoration including onsite visits and site-specific advice. The project elements and deliverables will be completed as described in the project proposal submitted to the Department and dated May 1, 2013. Lakeshore Natural Resources Partnership Inc.: E&W Twin River Project Priority Program: Lakeshore Natural Resources Partnership (LNRP) proposes to build upon past efforts and further develop the newly formed Friends of the Twin Rivers group by 1) providing targeted watershed education and outreach to local community members including directly engaging high school students, 2) expanding the network of student and community volunteers collecting water quality data throughout the watershed at strategic locations following the Water Action Volunteers monitoring protocols, and 3) leading a strategic planning process for the Friends of the Twin Rivers group. LNRP will facilitate at least two community education events, one symposium for high school students, and quarterly community meetings. LNRP will submit a final report summarizing the project to the Department. The project elements and deliverables will be completed as described in the project proposal submitted to the Department and dated December 8, 2014. Lakeshore Natural Resources Partnership Inc.: Friends Of The Twin Rivers Action Plan: Lakeshore Natural Resources Partnership (LNRP) is sponsoring a project to continue to support the Friends of the Twin Rivers by engaging area citizens in educational activities in the Twin Rivers watersheds. Specific project activities include: 1) Hold beach clean-up event; 2) Host a rain barrel workshop; 3) Host Water Action Volunteer (WAV) training sessions; 4) Host a river clean-up event; 5) Host educational seminars; 6) Host volunteer Restore the Shore Work Day events and write annual reports detailing invasive species found and habitat improvement project ideas in the watersheds. Lakeshore Natural Resources Partnership (LNRP) is sponsoring a project to continue to support the Friends of the Twin Rivers by engaging area citizens in educational activities in the Twin Rivers watersheds. Project final deliverables include: all data collected, agendas and minutes for planning meetings, presentations, newsletters and educational materials provided to the public. Specific project activities include: 1) Hold beach clean-up event; 2) Host a rain barrel workshop; 3) Host Water Action Volunteer (WAV) training sessions; 4) Host a river clean-up event; 5) Host educational seminars; 6) Host volunteer Restore the Shore Work Day events and write annual reports detailing invasive species found and habitat improvement project ideas in the watersheds. Brown and Kewaunee Counties hire an aquatic invasive species coordinator similar to Manitowoc Countys coor­dinator. Monitor to follow up on Clearly Exceeding phosphorus values and Poor mIBI. Increase funding to Counties to restore wetlands. Restore wetlands for lake and stream water quality protection. In 1795, French-Canadian Jacques Vieux, the first European to settle in the area, established a fur trading post northwest of present day Mishicot, in the current East Twin River watershed. The early settlers of Mishicot came from many countries, including Germany, Bohemia, Switzerland and Canada. A sawmill was erected in 1844 by Daniel Smith and Mishicot, Wisconsin was born. Daniel Smith named the village after his friend, Chief Mishicott, as a sign of his respect for the leader of the area Potawatomi community. The major component of the local economy has always been agriculture. While many dairy farms dot the countryside surrounding the village, the area's farmers produce much more, including grains, vegetables, meats, and wool. Also of note is that many of the farms in the Mishicot area have been run by the same families for more than a century.